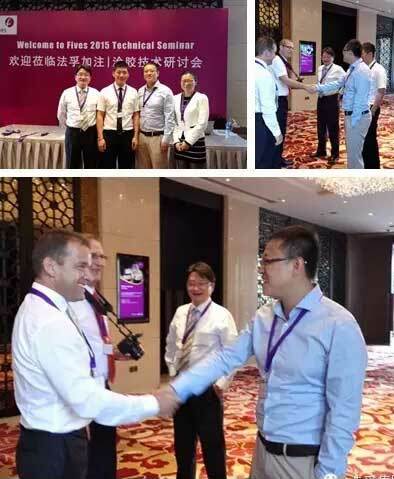 On Nov 5 and 6, 2015 RapidCharge® and DeckerSealing® product lines technical seminar dedicated was organized by Filling | Sealing office in Guangzhou (China), in the presence of a hundred customers, prospects, and business partners, among which were the major players of the automotive market, coming from China and abroad. With a record attendance, customers testified of their deep interest in Fives’ technical breakthrough. Three years after the latest edition of this major event, the objective of Filling | Sealing teams was to introduce Fives’ most recent innovations in testing, filling and sealing activities, especially with RapidCharge® M Elite; and in service with RapidDiag® diagnosis kit. The guests were very enthusiastic and asked many questions when those pioneering solutions were presented. The impact of new vehicles technologies (HEV, full electric…) on filling process and equipment was also disclosed, proving that the design of the RapidCharge® M Elite range is definitely advanced to match future technological evolutions of automotive makers. The introduction of new refrigerants (HFO, Co2, etc.) and ATEX regulations were discussed separately. The second day of the seminar was dedicated to visiting the new assembly workshop of Filling | Sealing located in Huadu, in Guangzhou area; on this occasion, locally assembled machines were presented to the visitors.